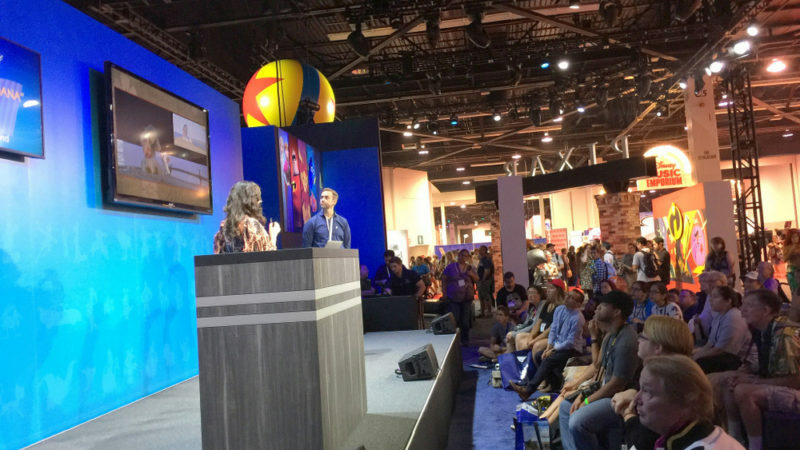 For most attendees, Disney’s D23 Expo spells fun and entertainment. 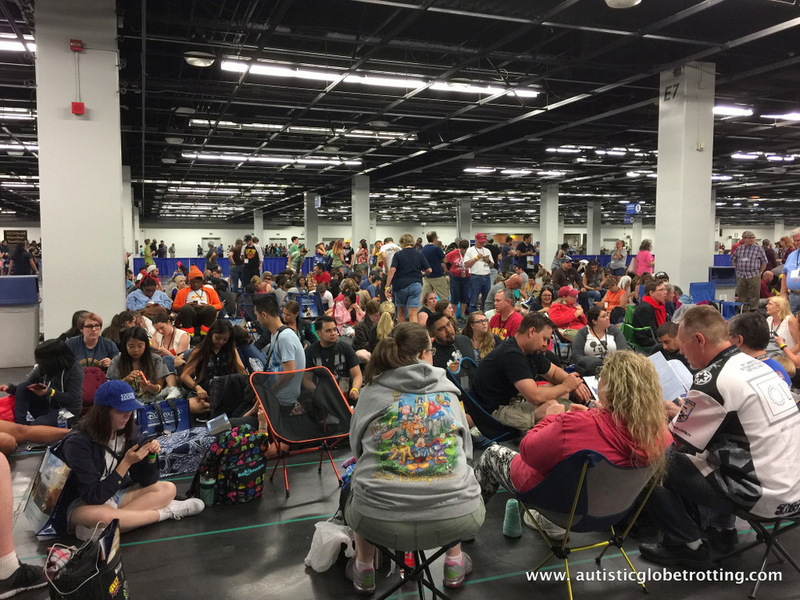 For our family, the Expo will be remembered as a weekend filled with Disney magic that changed our son with autism. 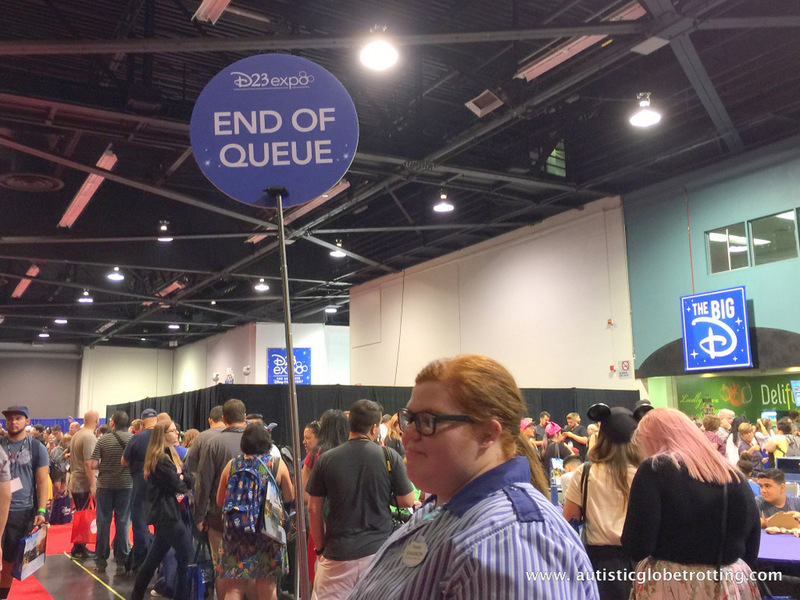 Disney’s D23 Expo is the ultimate experience for any Disney fan. The D23 Expo started back in 2009. 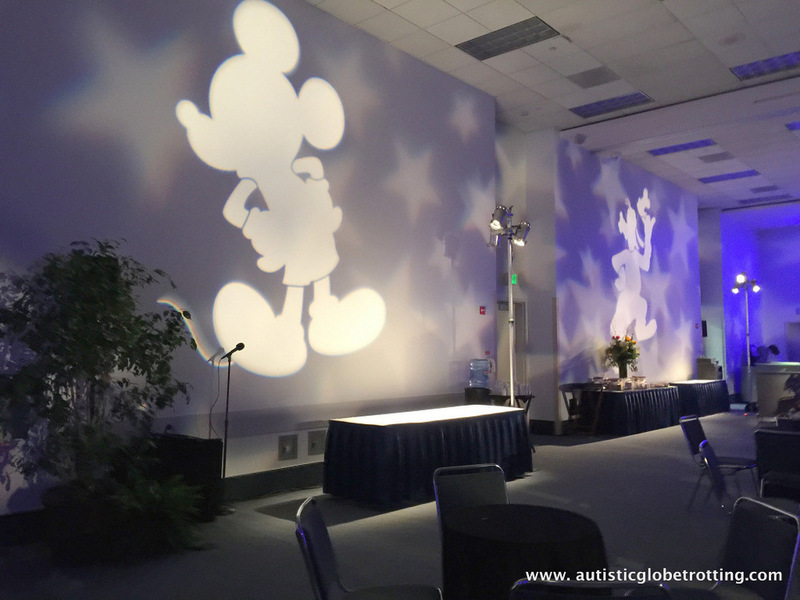 It happens every two years at the Anaheim Convention Hall near Disneyland. 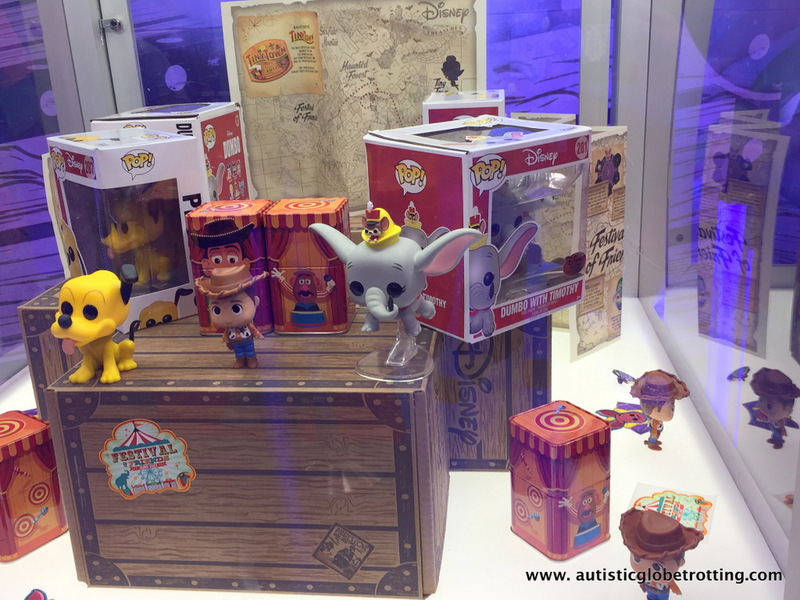 The three-day event is filled with news, announcements, and costumes as well as Disney memorabilia. 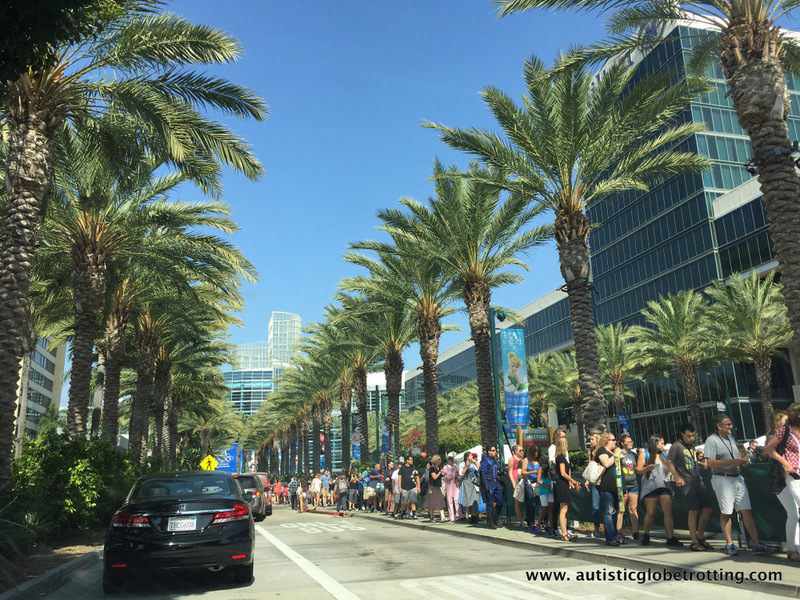 Last month, my son with autism and I attended the D23 Expo for the second time. Compared to the last time we visited back in 2015, this one had more events and panels scheduled. 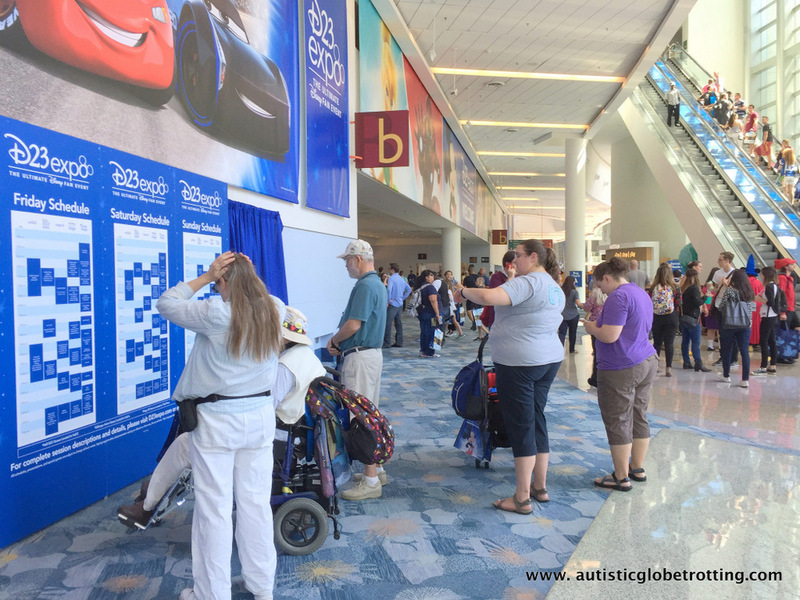 Though the D23 Expo provided no specific autism accommodations, my son still managed to have fun. 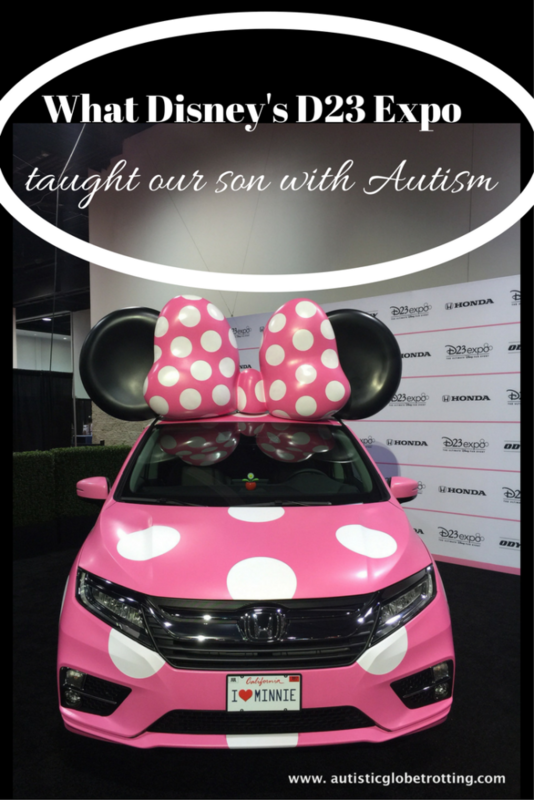 In fact, the Disney D23 Expo taught our son with autism valuable life skills. 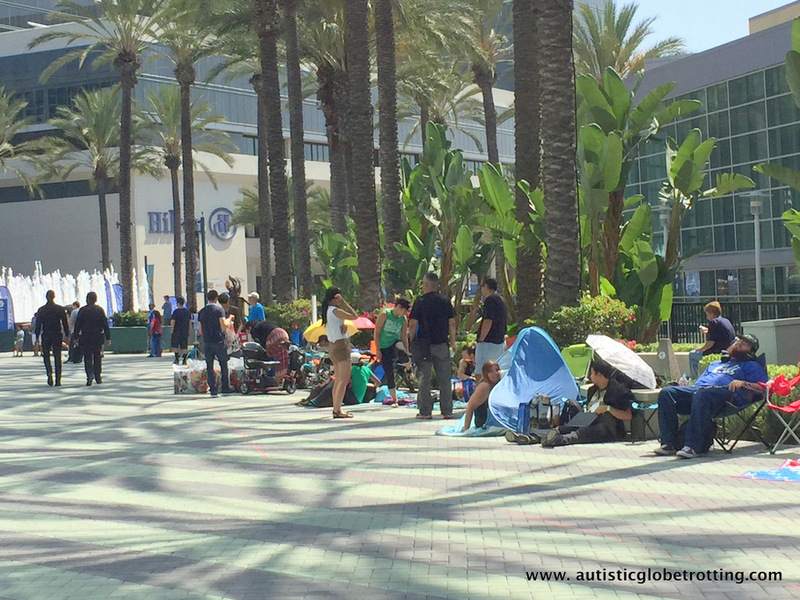 Since the Expo offered no front-of-line accommodations, my son had to stand in the long lines. I thought that would deter him from wanting to return after the first day. I was wrong! Not only did he stand in the Friday lines, but he expressed a desire to wait overnight for the coveted Saturday morning panel that featured the Disney movie announcements. This panel is so popular that fans start lining up in front of the convention center on Friday evening. Those wanting to get a mental picture of what the line looked like should envision a cross between the Best Buy Thanksgiving Black Friday line and a busy homeless encampment. Back in 2015, when my son suggested we stay the entire night in line, I refused. This year he was more determined than ever to do so. And he did. He chose to stay from 6-10 PM outside the convention room on the floor surrounded by thousands of other fans. I couldn’t believe this was the same person who always complains about spending any time outdoors. Luckily, the organizers let everyone enter an assigned hall in the building by 10 PM and wait inside until 9 AM. Here again, our son was determined to show tenacity. He sat on the floor like everyone else. Unfortunately, his phone battery was dead, so he had no electronic devices to keep him entertained. Furthermore, I knew the lighting and noise (Disney movies were playing loudly on screens all night) would bother him. Again, he never complained. Disney proved to be an incredible motivator. It turned out that sitting in the 12-hour line was only the beginning. The D23 Expo also encouraged him to come out of his shell and socialize. One of the bonuses of attending an Expo of this caliber is that you can chat with people that you might not get the chance meet in your everyday life. 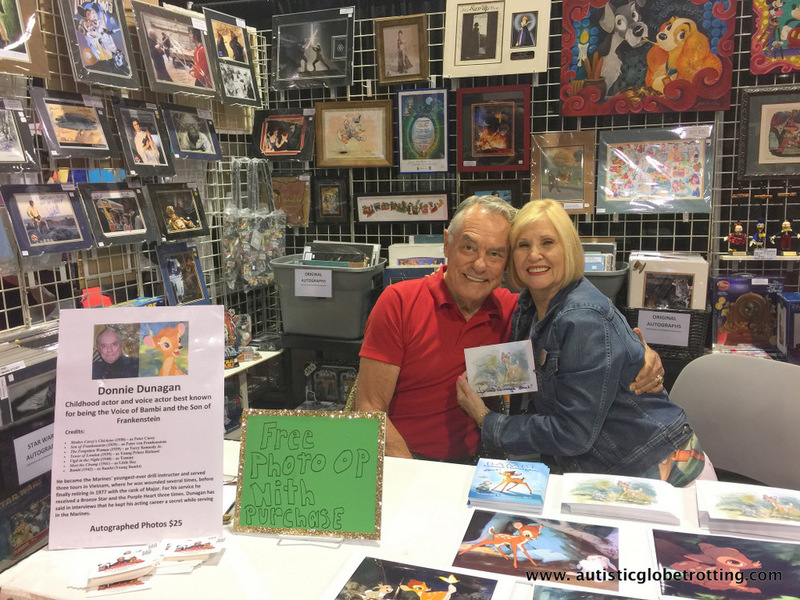 This time, we got to talk to the original Tinker Bell and the actor who was the voice of Bambi. 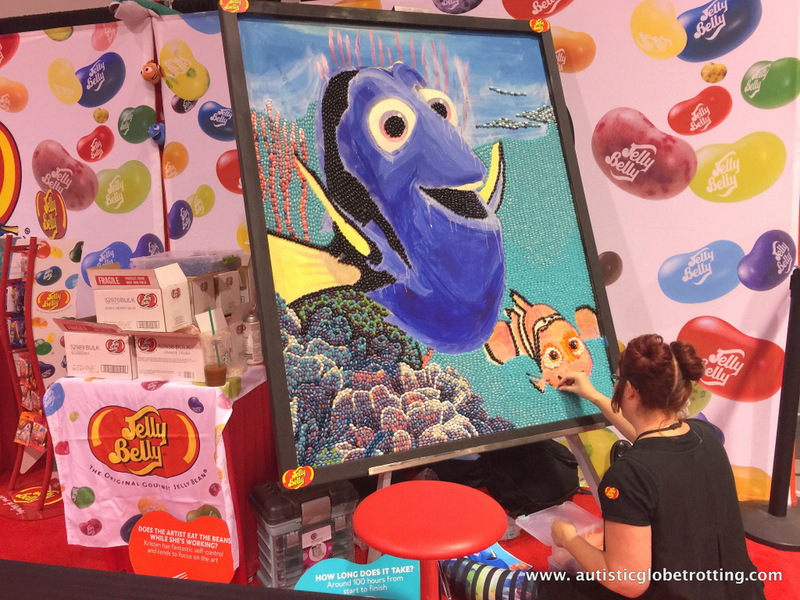 Other interesting folks we met were Disney animators, a talented barista who designed Disney figures on the beverage top and even an artist who was creating a ‘Finding Nemo’ mural out of Jelly Belly beans. My son was particularly fascinated with Ken Pellman and Lynn Barron who co-wrote a book about cleaning Disneyland. After working for almost two decades as Janis (janitorial positions), they penned a book detailing the cleaning methods the park uses to make it look so clean and spiffy! To my surprise, my son started initiating conversations while standing in the lines. When I asked him about it later, he told me that he enjoyed meeting and chatting with people who share his passion. In fact, he said that talking to people became one of the aspects he enjoyed about the D23 Expo. According to him, it made him feel part of a community, something he rarely gets to experience in the real world. Moreover, the people were incredibly kind to him; offering him snacks and even getting him to participate in games. Chalk it up to the Disney magic! If you are an autism parent like me, you probably know what I mean. Kids with autism don’t really like new foods or new textures. Well, the D23 Expo convinced my son to leave his comfort zone and be open to new things. 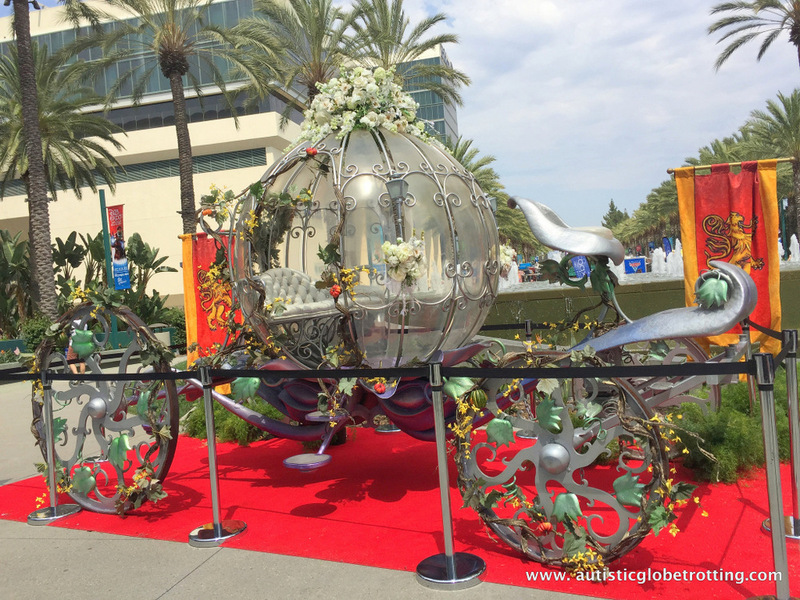 This year the D23 Expo featured a huge life style area called My Disney. Among others, the section had foods and clothes. 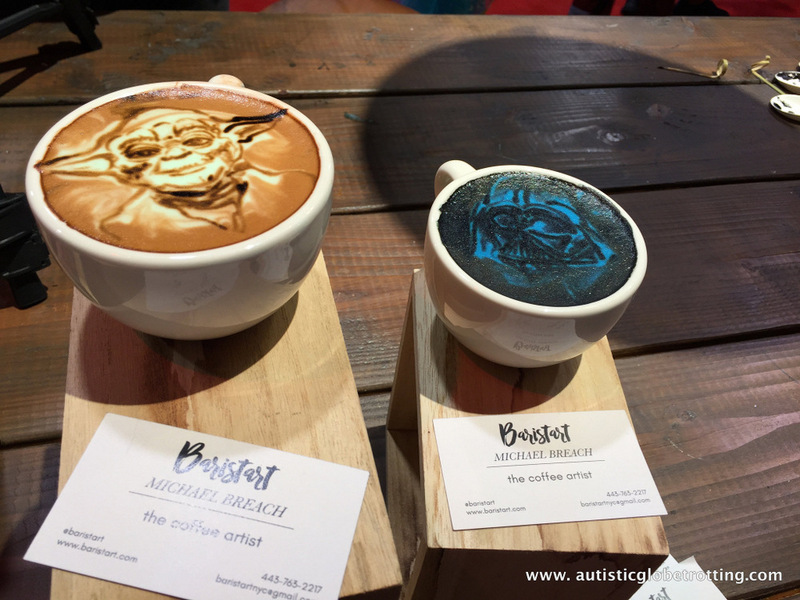 I’ve been trying to persuade my son to try coffee for some time now, but he refused. 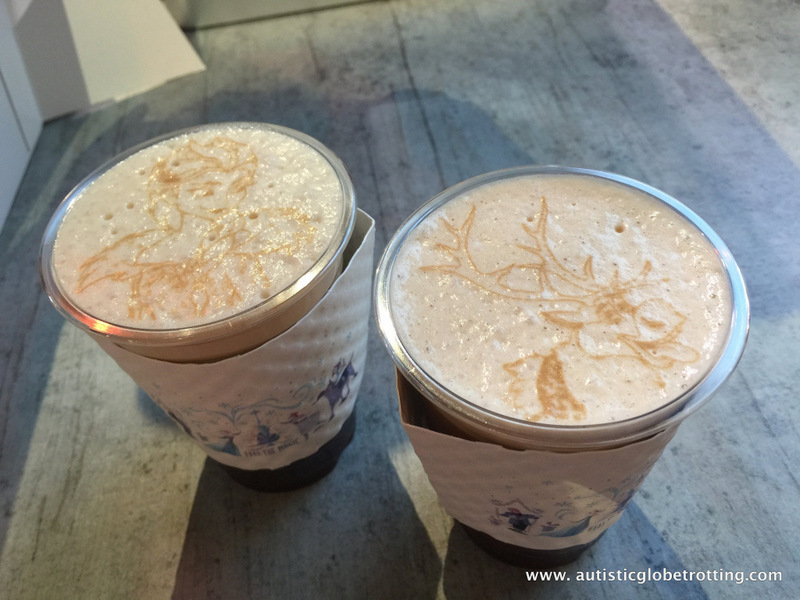 This time he agreed to taste nitrogenated coffee when he saw that it had a frozen character ‘drawn’ in the foam on top. He liked it! He also asked me to buy a pair of marvel printed flip-flops after refusing for two decades to wear flip flops. Based on the past visit, my son knew the D23 Expo offers a plethora of shopping opportunities. In fact, he had saved quite a bit of money to buy souvenirs. It turned out; he wanted to buy more items than he could afford. Unfortunately, he ended up spending all the money he had the very first day. Of course, he later regretted his choices, but there was no possibility of returning most of the items. Like I explained to him, he needed to sharpen his shopping skills and get better at prioritizing his shopping list. Of course, he did have a meltdown over not having money to spend during the remaining two days. However, he learned a valuable lesson. Now, he understands the concept of “think before you buy” much better. Moreover, this experience also taught him to be savvier about finding freebie opportunities. 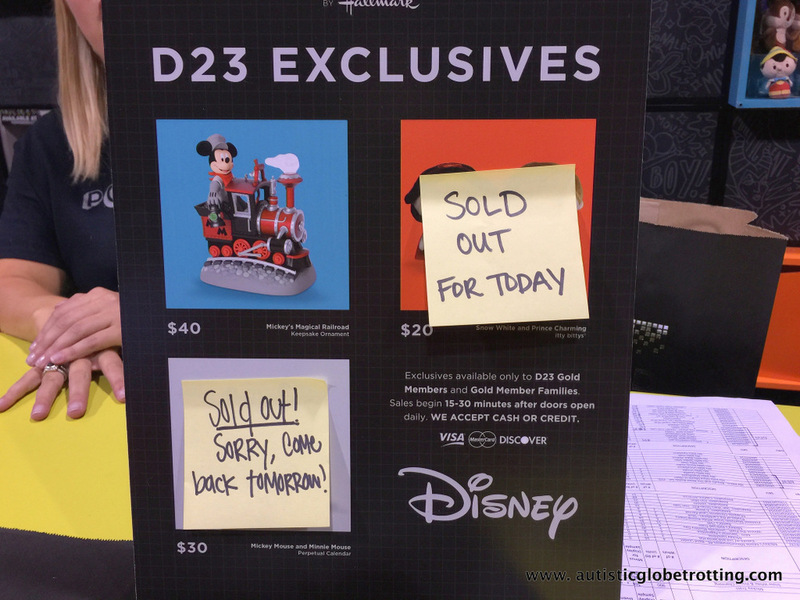 During the last D23 Expo, he hadn’t paid much attention to giveaways. This year after going broke early on, he made a point of finding them. 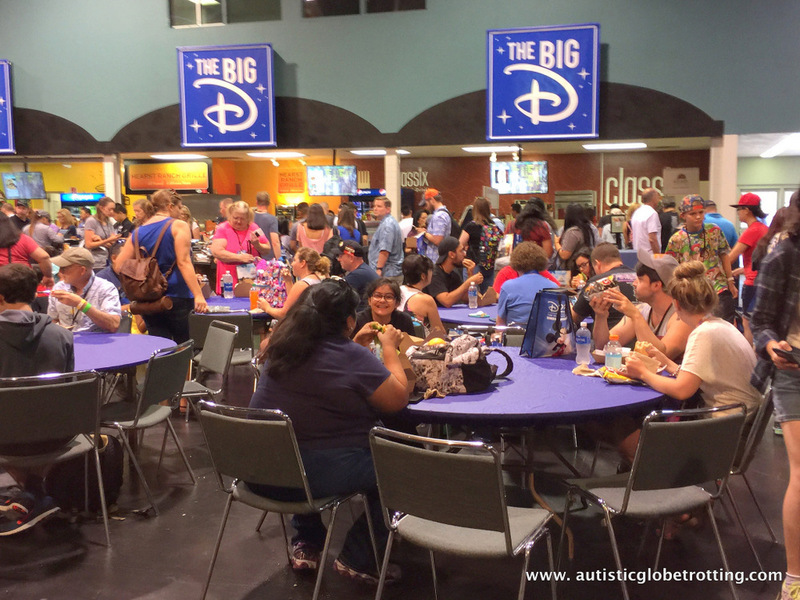 Though a fun event overall, Disney’s D23 Expo is not an autism friendly venue. Between the noise, lights, and thousands of people it is easy for anyone to experience a sensory overload. During the three days, there were times our son did need to take a break. As we discovered, the top floor was THE perfect spot to regroup. It was much quieter than the Expo floor. While exploring the second floor, we came across the Sorcerer’s Lounge. For those of you who haven’t heard about it, that’s the VIP lounge. The Sorcerer ticket is the ultimate D23 experience. After the initial sticker shock of $2,250, it does come with some great perks. Benefits include tours of the D23 Expo show floor before it officially opens to the public as well as abundant Disney swag. Ticket holders are invited to attend two exclusive receptions with Disney characters. Moreover, they can relax in the Lounge after enjoying a massage from the on-site therapist. But the perk my son liked best was the fact that Sorcerer ticket holders get reserved seating at ALL presentations. They also get exclusive shopping times in the different stores. In essence, the ticket frees its holder from waiting in ANY line. It did not take long for him to decide he wanted to start saving up for his next project – the 2019 D23 Sorcerer’s ticket. 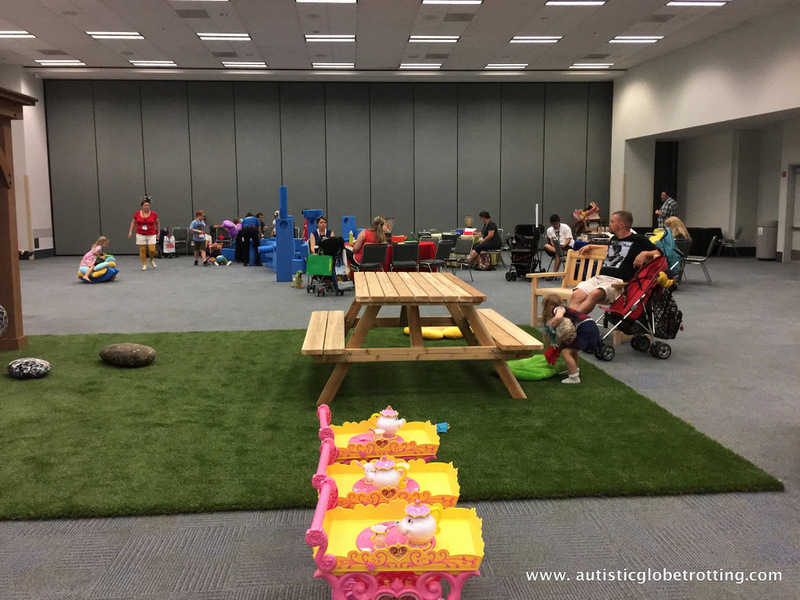 How has travel changed your child with autism? Share with us in the comment section below. Next Post: Why Book an Adventures by Disney Costa Rica Tour?